Another cave hex map with some up-and-down in order to try to show two levels overlaid on each other. It’s a twisty, two-level overlay with four openings to lower levels, and the large opening in the top-right rooms is like a balcony overlooking onto a larger room underneath (which could yield some interesting complexity in a combat situation). The green area at the far right is a pool. There’s a ledge on the far side, across the water. There’s also a tunnel opening underwater that connects to a passage back to the central vertical shaft. At a closer level of zoom, the shading indicating areas underneath other areas. When the image is zoomed out, though, it just appears as a shade, though it’s still probably adequately functional. The map wasn’t designed to be colored, but experimenting with it worked well enough that I decided that this should be the version to post. This seems like something that would be found in a jungle setting. I imagine it with the entry steps, although wide, almost entirely hidden by vines and overgrowth. But, of course, you can set it wherever suits. This should have been included from the outset, really. Since the adventure in the Wilderness of Ordurak is dealing with an unknown wilderness region, the players should have a map with only limited information on it. So, this is a map that GMs can give their players that shows them the known lands in the eastern part of the map, and only the limited information about the region of Auskenheim and the road from Calogero. A few names remain on the map for things that are known to be out there, so there’s a general sense of where they are, but not a clear indication on the map. It’s also another chance to show off the work that Stephen Peto did on making such an SPI-like map. Even if you aren’t interested in the DragonQuest adventure, the Map and Gazetteer are a really great setting that could be used with any fantasy campaign. This map is now included in the bundle from DriveThru. If you didn’t get notification already, drop us a line and we will get that sent to you right away. (https://plus.google.com/u/0/communities/108245358165736516269) for the next Exquisite Corpse. This one will be an overland map with 5- or 6-mile hexes. To make it work with the rest of my production workflow to put it all together, each participant will work with a rectangular area (see below) that will map into a hex grid layout. This project is open to all participants. Contact me on Google+ (preferred) https://plus.google.com/u/0/112759340492106094051 or email rodger@antherwyck.com. Although G+ is great for the discussion, we’ll probably need to use emails to share the final files back and forth. 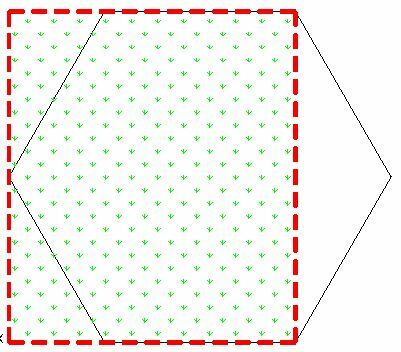 Each contributor’s field will be a rectangle that includes most of a hex, plus a little bit of two adjacent hexes. These will be about 5-1/4″ wide x 6″ high. Finished pieces should be 300 dpi (1558 x 1800 px). If grid is not included in the final art, clearly identify where openings are so next person can make reasonable connections. If the final scan is oversized, provide clear crop marks. Going westward, the extra part outside the hex (520 x 900 px) will be the baton. For north and southward, a narrow bit (we’ll figure a reasonable width) of the existing map will be the baton. Hex scale is assumed to be a 5-6 mile hex. If you have difficulty downloading, send me your email address, and I can email this to you, as well. 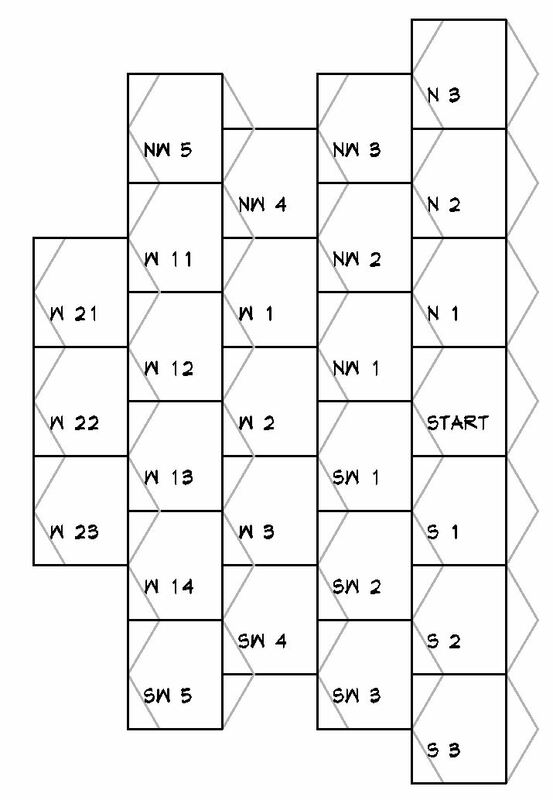 Also note: I’ll be overlaying a hex grid over the finished assembled map, so don’t worry too much about including it if it presents a difficulty, but do try to give me a cue at least where the hex corners should be. With the original (surrealist) Exquisite Corpses, there is a certain desire for absurdity and discontinuity. So don’t get too concerned about having it “work” with the adjacent spaces. There’s nothing wrong if some parts are a bit odd and don’t seem to match up. This is a fairly simple hex map showing a path and a stream crossing with some stepping stones. The other elements are intended to be the trunks of trees, but they may not read that way, since there are no branches or leaves. But that’s what those other bits are meant to be. 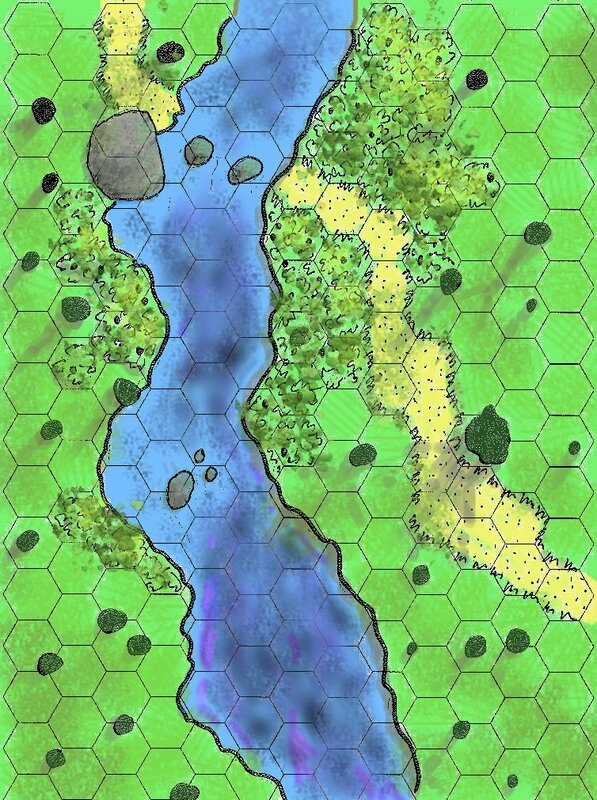 The scenario envisioned for this map to be used with was an ambush by a couple of archers who are working in conjunction with a nixie/water sprite. Most of the water is too deep (more than waist deep) to be able to be easily forded, other than near the rocks at the crossing, so a fight on both sides of the water will be a lot of ranged combat (and the tree trunks as cover then become a significant element). I’m not a regular (or, at this point, even a sporadic) VTT user, so I don’t know if this is workable/usable for that sort of thing. Let me know if you use this in something like that, and let me know how well it works. The original was drawn in pen on a hex page, so the hexes are integral to this image, and not something that could be turned off. But if you’re playing a game that uses a hex grid for tactical display, then give this a shot.